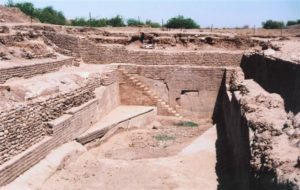 The name Mohenjodaro literally means ‘the Mound of the Dead.’ Though there are several different spellings of the site name, however, more commonly it is known as Mohenjodaro. The various other spellings are Mohanjodaro, Moenjodaro, Mohenjodaro, Mohenjodaro or even for that matter Mohenjodaro. This civilization was situated in the province of Sindh, Pakistan. 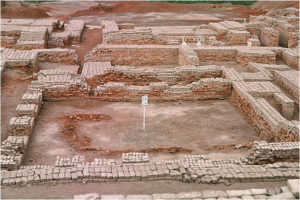 However, according to many of the publications, Mohenjodaro is located in India. This can be inferred by presuming the map of ancient India. However, since the creation of Pakistan in 1947, the site has been under the protection of the Department of Archaeology and Museums, Government of Pakistan respectively. Mohenjodaro is located in Sindh, Pakistan. This region is on a Pleistocene ridge in the middle of the flood plain of the Indus River Valley. The ridge is, however, now buried by the flooding of the plains, but was prominent during the time of the Indus Valley Civilization, allowing the city to stand above the surrounding plain. The site occupies a central position between the Indus River valley on the west and the Ghaggar-Hakra River on the east. The Indus still flows to the east of the site. The Ghaggar-Hakra riverbed, however, has now become dry. Over the years, there emerged a sudden need for more living space. As a result of this, the ridge was expanded through giant mud-brick platforms. Ultimately, the settlement grew to such proportions that some buildings reached 12 meters above the level of the modern plain. Hence at the time they were constructed, they would have been much taller. 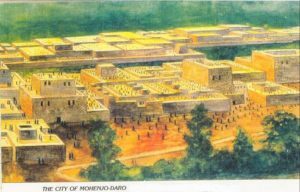 Mohenjodaro was one of the largest city-settlements of the Indus Valley Civilization which came to be built around 2600 BC. It was also one of the world’s earliest major urban settlements, existing at the same time as the civilizations of Egypt, Mesopotamia, as well as Crete. The archaeological ruins of the city are designated a UNESCO World Heritage Site. The name of Mohenjodaro is widely recognized as one of the most important early cities of South Asia and the Indus Civilization. 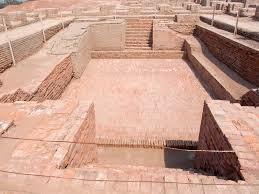 Mohenjodaro was built around 2600 BC. However, this city came to be abandoned around 1800 BC. The ruins of the city were discovered in 1922 by Rakhaldas Bandyopadhyay. He was an officer of the Archaeological Survey of India. He was directed to the mound by a Buddhist monk, who believed it to be a stupa. In the 1930s, extensive excavations were conducted under the leadership of John Marshall, K. N. Dikshit, Ernest Mackay, and others. There was a car which belonged to John Marshall and which was used by the site directors. This car has also been displayed in the Mohenjodaro museum. Further excavations were carried out in 1945 by Ahmad Hasan Dani and Mortimer Wheeler. The last major excavations were conducted around 1964-65. These were conducted by Dr. George F. Dales. Subsequently, however, any further excavations. This was because of the weathering damage to the exposed structures, and the only projects allowed at the site since have been salvage excavations, surface surveys, and conservation projects. However, in the 1980s, teams of German and Italian survey groups, led by Dr. Michael Jansen and Dr. Maurizio Tosi, used less invasive archeological techniques. These included the architectural documentation, surface surveys, surface scraping and probing in order to determine further clues about the ancient civilization.